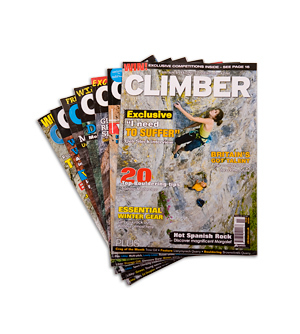 For the past few years I’ve been writing articles for Climber Magazine. In collaboration with photographer Mike Robertson we cover all things technical including ropework, climbing techniques, rock types and progressing through the grades. They are available here as free pdf’s so you can brush up on those rusty skills while planning your next climbing adventure. If you’re keen to learn more, be sure to bookmark this page as there’ll be more articles added throughout 2010. Rock Types - A flavour of the many varied rock types we play on, including how they are formed, what they're like to climb on and the type of gear that works best. Fine grained and bafflingly smooth – a unique climbing experience. Love it or hate it limestone is common worldwide so learn to embrace it. Mountain rock par excellence, with all the vagaries of quality that entails. The connoisseur’s rock type; high friction and beautiful designs. The rock type of Gogarth and Arapiles - world class - enough said. Don’t let grit be your achilles heel, improve your technique now. Subtle and technical, dolerite requires commitment and finesse. A round-up of the odd stuff we climb on like conglomerate potato fields. Grade Tour - Ever wondered what it’s like to climb the next grade? Well now you can find out with this tour from V.Diff to E3. Get a taste for life at that grade plus a close-up look at a profiled route. on The Arete, Hen Cloud, Staffordshire; a compelling and intimidating line with a committing crux. on Red Wall, Porth Clais, North Pembroke; obvious moves all with good gear makes this a delight. on Bollard Edge, Black Forest, near the Roaches, Staffordshire is worth seeking out, a quiet gem. on Sea Groove, White Tower, near Mother Carey’s Kitchen, Pembroke; graceful climbing in a dramatic setting. on Rubberneck, Third Cloud, Five Clouds, The Roaches, Staffordshire; a small route that packs it in so don’t expect to breeze it. on Snozwanger, Mowing Ward, Pembroke; the position is superb, the climbing delightful. on Vector, Bwlch y Moch, Tremadog, North Wales is every bit the classic you’re expecting. on Wraith, Mother Carey’s Kitchen, Pembroke; a big steep pitch that keeps on going - excellent. Essential Technical Stuff - These articles have a technical flavour and tackle some of the more baffling bits of climbing. how to be a more considerate and safer leader. belaying tips and what to do at the lower-off. advanced techniques and how to strip the route. all you’ve ever wanted to know about basic trad gear. advanced gear tips and trade secrets at your disposal. belay refresher and ropework systems made clear. learn all about dynamic belaying for a softer fall. here it is, the essential guide to deep water soloing. a close look at sea cliffs and how to survive them. staying safe and being efficient on longer climbs. with a journey across one of Britain’s finest routes A Dream of White Horses.